UPPER EAST SIDE — An Upper East Side community group is hoping a public art installation will shed new light on the need to restore the East River Esplanade. Friends of the East River Esplanade, which focuses on the revitalization of the area from East 60th to East 120th Streets, is partnering with public art organization the West Harlem Art Fund to bring a temporary light show to the esplanade. The hope is that the project will call attention to the need to transform the ailing public space. 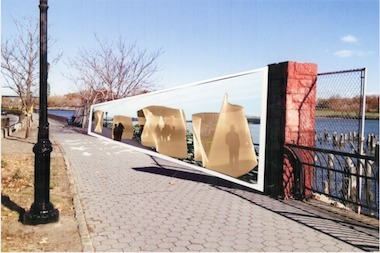 The Friends of the East River Esplanade want to create a public art installation in the space. The group chose Vicki DaSilva, a light artist, to create the inaugural project. DaSilva uses 4- and 8-foot fluorescent light bulbs to "paint" designs or words in a space. She photographs her work at night and leaves the shutter of her camera open to capture the pattern of the light. 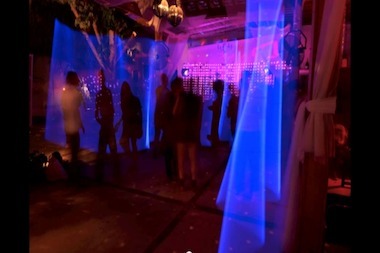 The result is an image of a space transformed by “structures” made of light. For this project, DaSilva will create her light paintings in different areas of the esplanade while it's used by the public. The installation is currently awaiting approval from the Parks Department, which is reviewing the plan, a spokesman said. Savona Bailey-McClain, chief curator with the West Harlem Art Fund, has worked with DaSilva on other projects, including a new installation under the Riverside Drive Viaduct. She thought DaSilva was a good fit for the East River project because her unusual method attracts attention. “It’s a process that’s not very well-known,” Bailey-McClain said. “It’s efficient and cost-effective, but it’s also almost like a performance. The final result will be a banner featuring several of the images created by DaSilva hung on a chain-link fence at 116th Street, an area that Ratner describes as a particularly unattractive spot. “It will be a transformed vision of the esplanade hanging over one of the ugliest parts of the esplanade,” Ratner said. They have also talked about making a video of the creation process and asking local businesses or institutions to show it, a community-engagement idea Bailey-McClain has explored with previous projects. There have been several recent developments in terms of revitalizing the esplanade. The City Council recently recommended that the Parks Department receive the $115 million needed to repair the underlying infrastructure. In addition, local politicians have put forth a proposal to bring food and entertainment concessions to the space by creating public-private partnerships. Ratner and Bailey-McClain applied for a permit from the Parks Department for the project and will also seek approval from Community Board 11, where the final piece will hang. The project is being funded by donations to the Friends of the East River Esplanade, and Ratner hopes that the temporary installation can go up within the next few months. “I really feel like this artist is the perfect fit because her work is all about re-inventing a space through light,” Ratner said.